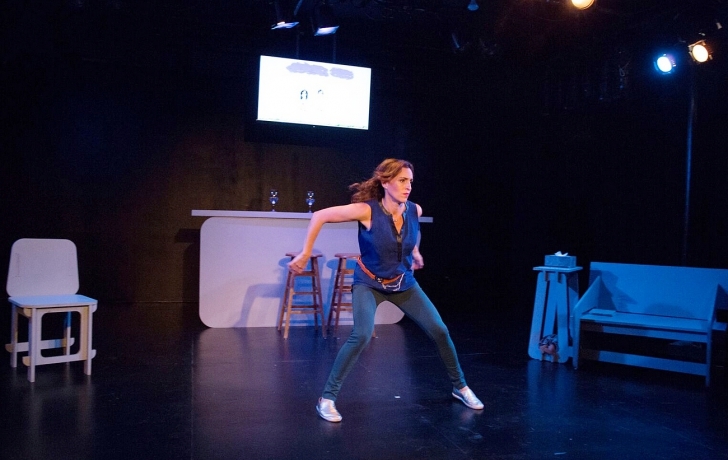 Francesca Van Horne in "Dancing Through It," her one-woman show at the Cherry Lane Theatre. Set in Tribeca, "Dancing Through It," a one-woman show at the Cherry Lane Theatre, rings remarkably true. The big loft, the Wall Street husband, the three children and the beautiful wife with SoulCycle-chiseled body who frets over redecorating. But there's another side to this Tribeca family. It’s the abusive husband who is hooked on coke. Francesca Van Horne, who lives on Chambers Street with her three children, plays the abused wife as well as 10 other characters, including the best friend, the maid, the lover, and even her young daughter. All are so authentically portrayed that it is easy to forget that just one woman is playing them. The show is inspired by the part memoir, part narrative that Van Horne wrote in a trundle bed she shared nightly with her daughter as her own marriage was coming apart several years ago. The entries, she said, were written in the "depths of grief and despair." A fortuitous introduction by her daughter's local swimming teacher to Tricia Brouk, who was to become the show's writer, director and choreographer, is what brought the show to life. "She took my writing and crafted it through her own lens," recalled Van Horne, who is adamant that her stage story, woven from these nighttime scribblings, is not a factual retelling of her own experiences. As the violence escalates on stage, the wife becomes more desperate to smooth things over with this man she still loves. Not unlike Van Horne's own reaction to her failing marriage. "I know that I was a Pollyanna and always trying to keep everything perfect to protect my husband, protect my family by not saying anything negative," she said. "I thought, 'If I just love him a little more, if I just keep the house perfect and if I'm perfect, it would all be fine.'" At the same time, she assiduously hid her marital problems from friends and family. "Everyone assumed that I had the perfect life. I was attractive, my husband was attractive, my kids were attractive and we had a certain amount of money. And I never said anything." After she began sharing her writing, Van Horne said, women as well as some men started to confide in her about their own marital problems. Drug and alcohol abuse among some financial industry high flyers is one reason that Tribeca has its share of domestic violence, she said, and then there is the "insidious" nature of domestic abuse, both verbal and physical. "Many of the women—and men—I spoke to didn't recognize that it was abuse," Van Horne said. "I didn't for many years." "Now," she adds, "I just speak the truth instead of pretending."